This amazing gemstone processes two colors. Preferred qualities show distinct pastel colors. Bi-colored tourmaline is an amazing gemstone that shows two colors, such as pink and green or pink and blue, within a single crystal. There is mention of bi-colored tourmaline in books from the early twentieth century, but it was not until 1970s that this gemstone became commonly used in jewelry. It is now popular among jewelry designers, and one can come across adornments that fully bring out its charm. A bi-colored tourmaline's beauty is judged by the balanced contrast between its pink and light green or light blue colors. Instead of colors that look as through a ruby and an emerald have been joined together, patterns of pastel pinks and greens (as shown to the next page) are preferred. 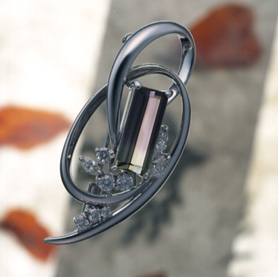 Tourmaline occurs in a wide range of hues. It is mined in all colors of the rainbow-red, orange, yellow, green, blue, and violet- but most of these are very dark. Bi-colored crystals having two separate colors, or material with three colors in a concentric ring-shaped pattern resembling the cross section of a watermelon, occur in limited quantities. Brazil, Mozambique, Nigeria, Siberia, and California in the United States each produce small amounts. Of these, Brazil appears to be the largest producer. Bi- or tri- colored tourmaline occurs because of differences in the crystal's chemical composition, caused by changes in the natural environment during formation. Ai different times during the tourmaline's formation, various color-causing elements such as iron, manganese, titanium, chromium, vanadium, and copper are incorporated into the crystal, causing layers of completely different colors to appear. Bi-colored tourmaline is generally left untreated, subjected to no processing other than polishing. Since the gem is relatively high included, it develops fractures and breaks when heated. This gemstone should be treasured for the magnificent harmony of its two colors- a beauty that is created by chance within the earth- as well as for the knowledge that no two pieces are exactly alike.